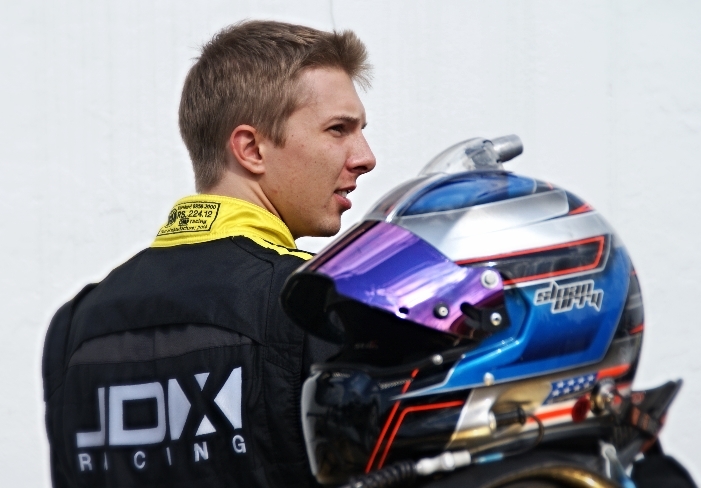 Ft.Collins, CO – Following a successful 2014 campaign in the Porsche GT3 Cup Challenge USA by Yokohama Championship, Porsche extended an invite to the JDX Racing / Hertz pilot Sloan Urry to attend the Porsche Young Driver Academy, which was held at Barber Motorsports Park this past weekend. Following a season that included seven podium visits, three for overall race wins and a total of ten top five finishes in the 16 round season, the pursuit for a championship ended at Road Atlanta just a few weeks ago. Although the curtain had dropped for the 2014 race season, a door was swung wide open as Sloan was one of only five drivers to be selected to attend this years prestigious Porsche Young Driver Academy. The Porsche Young Driver Academy returned to Barber Motorsports Park for the third consecutive year. The Academy provides rising talent the opportunity to further develop their pursuit of a career in motorsports. Sloan received one-on-one instruction from Porsche Sport Driving School instructors Hurley Haywood, Patrick Long and Andrew Davis – not just on fine tuning his driving skills but in other areas such as classroom testing, personality evaluations and media training. The Porsche Young Driver Academy was designed to help future stars of motorsport enhance their professionalism and marketability. Sloan commented, “The two days at the Academy were the most valuable experience to date in my young career. The time at Barber was a blast, not just the on track but in the classroom as well. The classroom training shed a lot of light on how I can continue to strengthen all off-track aspects of racing. Lapping sessions along with thorough debriefs with Academy instructors was huge. To work with and get feedback from a racing legend like Hurley Haywood is priceless, not to mention current sports car racing stars Patrick Long and Andrew Davis. It was an opportunity that could never have happened without the awesome support and leadership of my team, JDX Racing. I’m looking forward to continuing to build my relationship with Porsche and bringing home more hardware in JDX prepared Porsche race cars”. JDX Racing team co-owner Harrison Brix commented, “Sloan worked hard all season and being selected to attend the Porsche Young Driver Academy is a true compliment and honor for him and the team. This will give him the opportunity to further develop his talents in all aspects of racing, which is not only on the track, but off the track as well. We are very proud of what he has accomplished in 2014″.